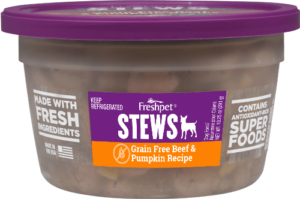 Our dog loves freshpet Beef and Pumpkin stew. We throw a spoonful on his dry food and he so enjoys it. He also goes bonkers over the Chicken Snacks. Learning new tricks has been so easy when Chicken Snacks are on the other end.